Re-posting this information (originally posted 4/4/2011). Shore homeowners may face the required crawl space venting issue when renewing their current flood insurance policy. I attended an interesting seminar today regarding flood vents (I am such a house nerd). The cost for flood insurance is based on the elevation of the home (how high it sits off of the ground), and proper venting of the structure. If the venting does not conform to current codes, the home owner will pay a substantially higher insurance premium. 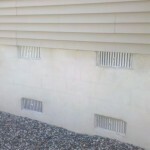 Basic facts: the bottom of all vents can be no higher than 12″ above grade (for example- the upper row of vents shown in the photo are disqualified); the standard sliding aluminum vents must be disabled in the open position to qualify (not practical in the winter months with exposed pipes); garages and detached buildings must be vented; and if the inside grade on all 4 walls of the crawl space is lower than the outside grade, insurance regulations classify the space as a basement. Engineered vents (such as SmartVents) are common in new construction, and can be installed to retrofit an exisiting house to conform to code. For more information: http://www.smartvent.com/ or contact your insurance agent.